It looks like Florida Gov. Charlie Crist's backing of President Obama stimulus package isn't hurting his approval ratings among Republican voters. (CNN) - It looks like Florida Gov. Charlie Crist's backing of President Obama stimulus package isn't hurting his approval ratings among Republican voters. A Quinnipiac poll released Wednesday finds the Republican governor received an impressive 68 percent approval rating from members of his own party - the same numbers he drew in November, before he appeared with the president at an event plugging the stimulus plan. He draws roughly the same positive ratings from Democrats and Independents: 66 percent of Democrats and 68 percent of Independents approve of the job Crist is doing during his time in office. Crist's 25 percent disapproval rating among Republican voters is sightly higher than the 20 percent of Democrats who give him negative marks. "There may be some GOP activists who think Gov. Charlie Crist isn't conservative enough, but they aren't striking a chord around the state," said Peter Brown, assistant director of the Quinnipiac University Polling Institute. "Across America, an awful lot of governors are seeing their approval ratings dip as the recession requires higher taxes and cuts in government programs, but Teflon Charlie keeps chugging along with numbers that most of his fellow governors would die for." Fifty-eight percent of voters, a slightly lower number, believe the governor should be re-elected if he chooses to run for a second term. The Quinnipiac University telephone poll of 1,332 Florida voters was conducted April 6-13, and has a margin of error of plus or minus 2.7 percentage points. I dont think he will toe the Rush Limbaugh line,therefore he loses. You get ratings like this when you actually care about , and serve the people of your state. Meanwhile, over at "Angryville", AKA Fox News, Sean, Ann, Billbo and the dingbat beltway boys are the laughing stock of the nation .... idealogues on crack. Think their opion counts for any votes anymore? Think again. Nice job, Govenor Crist. Keep up the good works. RAG, he didn't support Obama. He was one of McCain's biggest supporters. He was considered for VP. That brings his judgement into question. 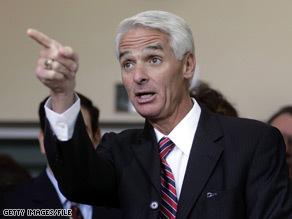 Why WOULD backing legislation to fix our economy hurt Crist's approval? Florida Republicans must be smarter than the typical Republican. The republican mob will strip him for this. How much more glaring evidence does the GOP need to have shoved in its face that its current course is WRONG? I mean, there's all kinds of evidence that their ideology has failed, but it's understandable that they'll rationalize and do everything they can to explain away facts and evidence proving that. But evidence like this...that the nasty obstructionist rhetoric and behavior is a losing tactic? Nobody's asking for an apology...we'll trade you the fact that we deserve one for you simply changing course, acting like adults and doing everything you can to help bring solutions to DC, rather than just roadblocks. Crist is one of the few Republicans I can stomach. Didn't grandstand and took the money for his people, I appreciated that. Hope he's gonna stay sane and middle of the road, doing the right thing, instead of aligning himself with the "conspiracy-theory conservative" loons. This just shows that being a Republican (vs. a Republican't) that can be civil to Obama and support him when as appropriate will be a plus in the next election cycle We'll see the extreme right conservatives Republicants fall by the wayside. This economy is already picking up and everyone in my middle class extended family has gotten an Obama tax cut starting this month so even the half that are Republicans will support people like Charlie C.
He's the GOP's only hope for a decent showing in 2012, because he's NOT a Leave-it-to-Beaver "family values" nutjob. I'm a Florida Dem and Crist has my vote if he decides to run for a second term or run for senator. As long as these "GOP activists" keep undercutting popular members of their own party, the GOP as a whole has no chance of being anything more than an impotent, marginalized political group. Crist may be on to something!! Help your state (by taking the Stimulas money) and not cow-towing to the base! He's too smart to run against Obama in 2012....but look out out in 2016! Did he get boss limbaugh's blessing for this? He is one of the few Republicans that I would consider voting for in the future. However, I said the same thing about John McCain when he was a true maverick. Unfortunately, the base got a hold of him and he flip flopped on just every issue and moved back to the extreme right. I'm afraid that this will also happen to Crist. Sad. He is a good Governor and as a democrat...I will support Governor Crist for re-election. He's not a partisan republican and if the Repubs were smart he'd be their nominee, but they're not smart....The party of Rush Limbaugh and Sean Hannity and FoX News.